If you’re like most students, you spend most of your lab time getting yelled at for using the wrong piece of glassware in an experiment. At least, that’s what always happened to me back when I was taking chemistry for the first time. Fortunately, I understand how irritating this can be, so have put together a small tutorial so you’ll know what equipment to use when, and what equipment when to use when not. That sounded better in my head. Like most scientists, the vast bulk of this woman’s workday involves staring at tiny bottles. Note: A lot of glassware is used for more than one purpose, so you may see some bits of equipment used for purposes not mentioned here. It’s usually pretty obvious whether it’s being used correctly, so always use common sense! Here it is: A big list of the stuff you’ll be using this year! Goggles: If you learn to use nothing else this year, learn to use your goggles. I’ve personally known people whose eyesight was saved by their goggles – in one case, a hydrofluoric acid explosion burned off most of his face, but his eyesight was saved by goggles. As he put it later, you can fix somebody’s face, but if you lose your eyesight you’ve lost it for good. I know I make a lot of dumb jokes, but please don’t think I’m kidding in this case. Wear your goggles. 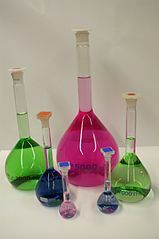 Beakers: Beakers are the round cylindrical things that have various units of volume stamped on the side. They’re good for heating chemicals over the Bunsen burner, though you shouldn’t heat them until the chemical dries because it will either burn or stick permanently to the side of the beaker. They’re also good for storing chemicals over short periods of time, as long as they’re covered with either Parafilm or a watch glass. 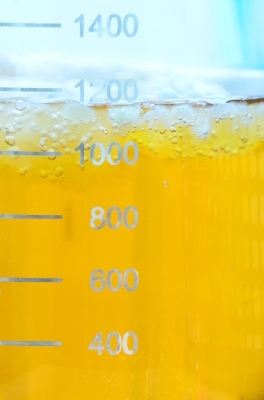 What they’re not good for is measuring the volume of a liquid – that’s what graduated cylinders are for. They can also be used as urinals, if you’re too lazy to walk to the bathroom. 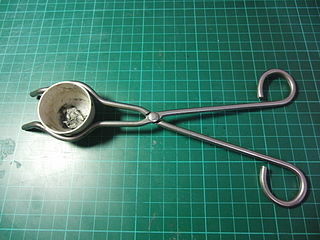 Beaker tongs: These are used to move beakers around. When using them, make sure to hold the beaker in the wide part of the tongs, not at the tips. I guarantee that if you try to grab a beaker with the ends of the tongs, you’ll be cleaning your experiment off the floor. My terrible drawing of beaker tongs. 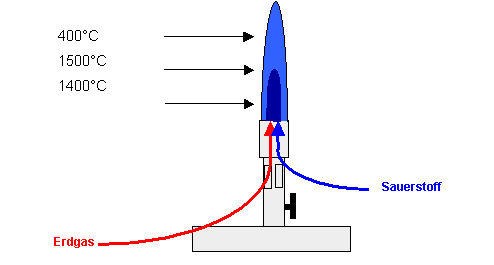 The blue circle shows how the beaker should be held. 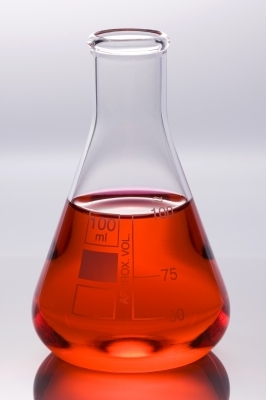 Erlenmeyer flasks: Erlenmeyer flasks have the same general purpose as beakers, except that you can also cram a cork into the top of it to store things for longer periods of time. 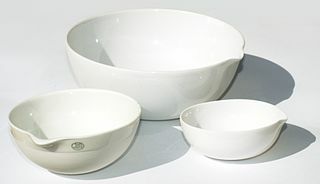 They’re also handy because if you boil something in them, there tends to be less splatter out of the top. 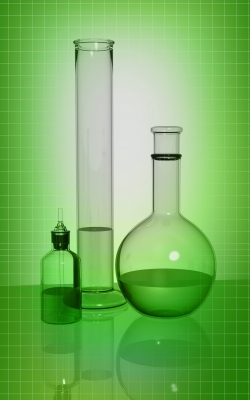 For most purposes, you can use beakers and Erlenmeyer flasks more or less interchangeably. Very few solutions in the real world have this color. Most solutions you find in illustrations of Erlenmeyer flasks have this color. Graduated cylinders are used to find the volume of liquid reagents to a moderate degree of precision. 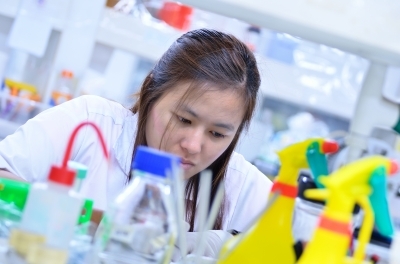 They are usually good enough for anything you need, but if you want higher precision you may want to go for either a volumetric flask or volumetric pipette. Or just ask somebody else to do it. The only picture I could find was this one. The thing in the middle is the graduated cylinder. The other things are a dropper bottle on the left (I think) and a round-bottomed flask on the right. Volumetric flask: If you want to find the volume of something to very high precision, a volumetric flask can be used to do this. Simply put however much solute you want in the flask and then add water to the little line at the top. Swirl it around and you’ve got your solution. These flasks are very expensive because they’re marked to a very high precision – most of the time a graduated cylinder will be just fine. 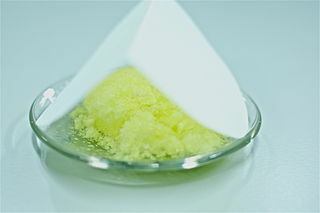 Solutions can be stored for short to medium periods of time in a volumetric flask. However, over time solutions can degrade, so if you need high precision, it’s usually important to re-make sensitive solutions after a little while anyway. Looks like somebody’s pulling overtime at the food coloring factory. Watch glass: This is the thing that looks like a big contact lens. Though the watch glass isn’t usually the best tool for any job, it’s enormously adaptable and can be used for just about anything. If you want to weigh small amounts of a solid chemical, do small-scale reactions, cover a beaker that’s being heated, or just keep cockroaches from getting at your sandwich, the watch glass is a versatile chemical holder thing. This chemical is using a watch glass to make a filter paper fort. Vial: For some reason, everybody always writes this as “vile.” Don’t do that. 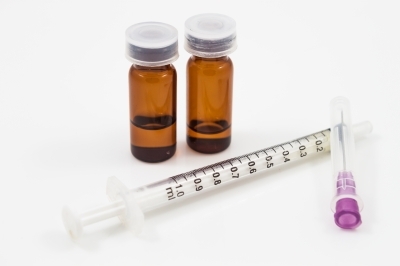 Anyway, vials are used for holding small quantities of solid or liquid compounds. Vials are more-or-less airtight, so chemicals that aren’t particularly reactive or hygroscopic can be stored in them for a long time. In other words, sodium chloride = good; iodine = bad. My dealer always packages my heroin in small brown vials. It’s the little touches like this that keep me coming back. Ring stand and ring: This is the core equipment you use when heating stuff up. The ring stand is the base and a vertical pole, while the ring is, well, a ring upon which you put other equipment (a wire gauze if heating a beaker/evaporating dish, a clay triangle if heating a crucible). Ring stand (the thing with three legs) and ring (the ring). I’m not sure what the deal is with the ball, though. Wire gauze: If you’re heating a beaker, Erlenmeyer flask, or evaporating dish, put a wire gauze on top of the ring so the container you’re heating doesn’t fall through. If it starts glowing, don’t worry about it. That’s what they’re for. It’s a screen door for fire! Clay triangle: When you put this thing over a ring, it gives you a nice little triangular area into which a crucible can nestle and be safely heated. I couldn’t find a good picture of one, so I made a really crappy one. 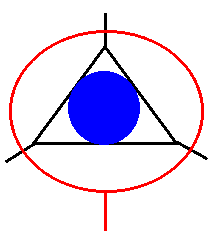 The black part represents the clay triangle itself, the red circle is the ring upon which it lies, and the blue circle represents the place where the crucible goes. Bunsen burner: This is the thing that makes all the fire when you heat something. The part at the top of the flame is hotter than the bright part at the bottom, so if you want to make things really hot, hold it about 3 cm over the top of the burner. Additionally, the bluer the flame, the hotter it is. To get the flame hotter, turn the thing at the bottom of the Bunsen burner to let in more air. They have Bunsen burners in Germany, too! Crucible and lid: If you want to heat something a little bit, a beaker will be fine. If you want to heat something a lot (i.e. until it glows red hot), you’ll want to use a crucible. Made of the most fragile ceramic in the world, crucibles can be used to heat things over a Bunsen burner until they melt, explode, or shrivel (whichever you want). One cautionary note: When you’re done heating a crucible, don’t put it in cold water until it’s cool to the touch – if you do, it will shatter and your teacher will murder you. Crucible (the white thing) and crucible tongs (the silvery thing). This picture shows the correct way to hold a crucible with crucible tongs – don’t use the pointy end, but the wide part in the middle! Evaporating dish: If you want to remove the liquid from a solution, or if you just want to really heat the heck out of a bunch of some solid, use an evaporating dish. Made out of the same material as a crucible, evaporating dishes are also unbelievably fragile and will shatter if you put them in water before they’ve cooled. Though you can use crucible tongs to pick them up in a pinch, it’s usually just best to wait until they cool. “This evaporating dish is too big,” said Goldilocks. Spatula and scoopula: Spatulas are used for moving small amounts of a reagent around, while scoopulas are good for moving larger quantities. They also tend to be used as stirring rods, which isn’t that great an idea. Pipettes: Already familiar to you as “eyedroppers”, pipettes are used to transfer small amounts of liquids from one place to another. 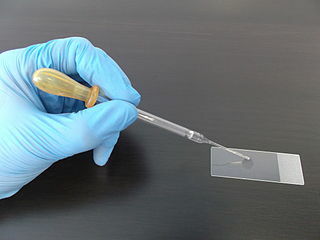 While most pipettes are simple little eyedropper things, volumetric pipettes have lines on the side that allow them to be used to transfer exact quantities of reagents from one place to another. Pasteur pipette. For the record, no lab in the history of chemistry has ever been this clean. 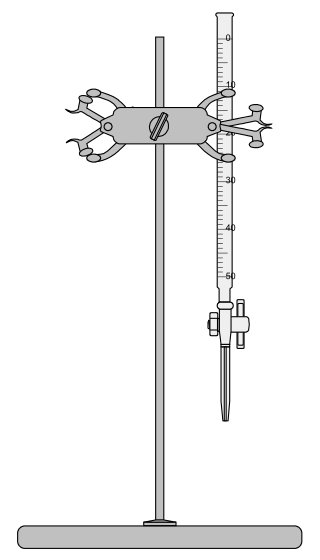 Burette: Also called a “buret”, this bit of equipment is basically an upside-down graduated cylinder which is used for chemical reactions called titrations (you’ll learn more about that later). 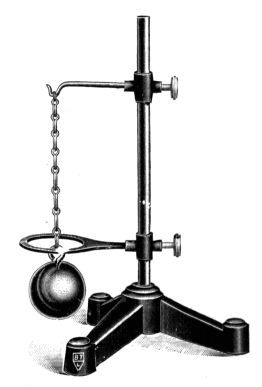 The picture below shows a burette affixed to a ring stand using a burette clamp. Funnel and filter paper: Funnels are, well, funnels. 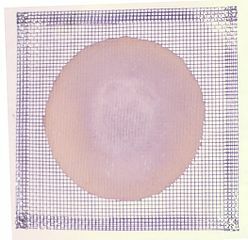 Filter paper (shown below) is paper with very fine pores that can be used to strain solid reagents from a liquid. There are about a million types of funnel that are used by chemists, but you’ll probably only see a regular boring ol’ funnel in an introductory class. Forceps: They’re tweezers. Seriously, just tweezers. Why we call them something different in the sciences, I have no idea. Probably so they can jack up the price. Rubber policeman: If you’ve got a lot of solid junk left behind in a beaker, you can use this to scrape it out. Not that anybody really ever uses these things – it’s just that you could if you really wanted to. And didn’t mind contaminating your product. Thermometers: It’s a thermometer. You already know what they look like, so I’m not going to find a picture of one. Stirring rod: Literally a stick made of glass that you use to stir stuff. They break easy, but cost next to nothing, so it’s OK.